Enjoy Gull Lake, tennis, hiking and June Lake. Shared spas too! 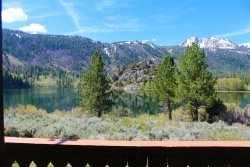 A spacious Interlaken condominium overlooking Gull Lake with incredible views of the Sierra Nevada Mountains. Relax in a beautiful Interlaken Condominium in the heart of the High Sierra Nevada mountains of June Lake, California. Upgraded and spacious condo with huge views. Perfect for gathering your family and friends. Direct views of Gull Lake and June Mountain right from your living room sofa. Incredible! A spacious Interlaken condo with spectacular views of Gull Lake and the Sierra Mountains. Spectacular lakefront and the High Sierra Mountains views at June Lake Interlaken. Accommodates two or a small family very comfortably. You'll love the views of the High Sierra in this newly remodeled condo! Incredible views of Gull Lake and June Mountain right from your sofa or deck. Cabin style room that sleeps up to four. Conviently located next to June Lake and the June Lake Village! Accommodates two or a small family very comfortably. Located next to the June Lake Marina. Best loaction in town! Cabin style motel room close to June Lake Marina and everything in town.